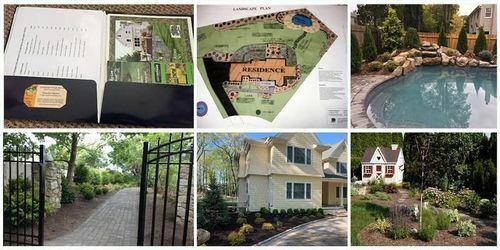 I am a landscape designer based in Sayville, Long Island, New York and specialize in all aspects of landscape design including residential entrance gardens, backyard settings, poolscapes, berms and walls, sun and shade gardens, privacy screenings, cottage gardens, and design of hardscape, such as patios, walkways and driveways. Involved in the design industry since 1996, I am a member of the American Horticultural Society and Garden Communicators International, and keep up to date by regularly attending landscaping conferences and subscribing to numerous horticultural publications. Known to possess such a deep passion for gardening and design, I was honored to have my own garden invited as a participant in the local garden tour in the years 2010 and 2018. Wanting to further communicate about horticulture, I started a gardening blog in 2010, and went on to become the author of three books, A Guide to Northeastern Gardening: Journeys of a Garden Designer, Landscape Design Combinations and Dream, Garden, Grow!-Musings of a Lifetime Gardener, each sharing my knowledge and passion of gardening and design. There are a variety of design services available to you depending on the size of your property and scope of your project. Detailed scaled site plans can be made of your property as well as computer rendered imaging with precise listings of plant common and Latin names, quantity and size and hardscape specifications. While meeting with you, we will discuss your wants and needs in order to achieve your landscape dream. If you are seeking professional gardening advice, garden coaching services are also available. I work directly with all my clients from development of the design to completion in order to achieve the landscape you always wanted. You can choose to implement the finished design on your own or have it installed professionally, a service which is available to you. I take great pride in making my customers happy and will personally be on site supervising construction from start to finish and after completion should you decide to have your design professionally installed. A well designed landscape can add beauty to your home, provide a place for entertaining and supply years of enjoyment as well as add value to your property. "Design is a process...a communication between client and designer. A garden is a reflection of its owner and should be enjoyed for a lifetime." Contact me for an opportunity to view my portfolio and receive a consultation. Thank you for visiting Landscape Design By Lee.